You are invited to the 20th Bonhoeffer Lectures in Public Ethics, featuring keynote speakers the Rev. Dr. William J. Barber and Rev. Jonathan Wilson-Hartgrove. Drawing on their extensive experience building movements for social change, these speakers will address the pressing issues of our diverse communities, calling us to the work of advocacy and resistance. 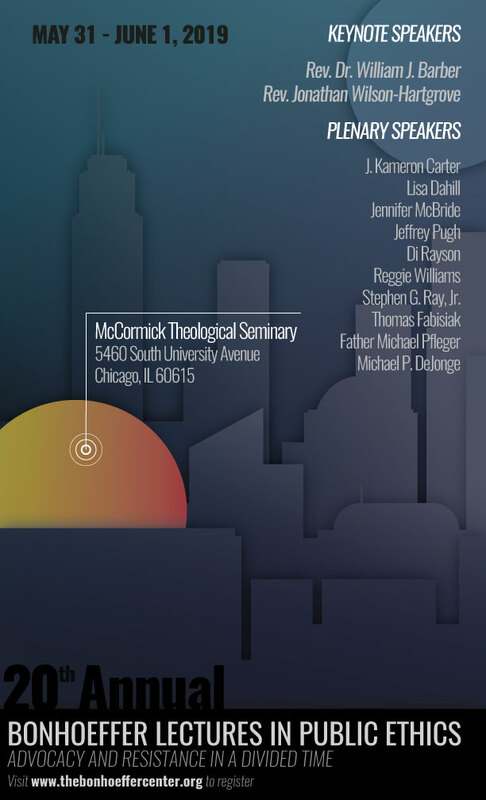 In order to address these concerns locally, this conference uniquely places Chicago organizations working for justice alongside leading scholars making constructive use of the theology of Dietrich Bonhoeffer. Scholars will give presentations that introduce Bonhoeffer as a resource for thinking in new ways about a select number of issues, including racism, mass incarceration, gender justice and environmental justice. Representatives from local organizations will then lead workshops, providing training in practices relevant to the issues and opportunities for engagement in their on-going work. This conference aims to serve laypersons, religious leaders, students and scholars from diverse faith communities in and beyond the Chicagoland area. Plenary speakers include: J Kameron Carter, Lisa Dahill, Michael DeJonge, Thomas Fabisiak, Jennifer McBride, Jeffrey Pugh, Stephen Ray, Di Rayson, Reggie Williams, and special guest Father Michael Pfleger. With workshops by: Faith in Place, Institute for Nonviolence Chicago, Restoring Rights and Opportunities Coalition of Illinois, Live Oak Chicago. *Paper and workshop titles to be posted in March, with abstracts distributed at the conference.